If you are in the market for construction management software, you are probably looking for the right one that will fit your needs. The ideal construction project management software gives you the ability to manage your construction workflow from site selection through close out, keeping your projects on schedule and under budget. An excellent construction management software minimizes data entry, prevents over-billing and double-billing from contractors/vendors, and maintains constant communication between project team members. The best construction project management software is not just a software, but rather a software suite containing all the essential construction management tools that are crucial to executing and completing a project successfully. How secure is the construction management software that your company is considering in investing in? This is important. Being SOC 2 Type II certified, Projectmates lets users be rest assured that all security measures are good to go, from secure and encrypted data with firewall security and disaster recovery to name a few. Projectmates routinely goes through audits every 6-12 months to keep up with the latest security protocols. Does the software that you're looking into have seamless exchange of data? Projectmates lets you notify team members via email notifications with documents, photos, and more to markup, annotate, and verify. Is it easy for your team members to communicate? Projectmates Construction Mobile App gives team members the ability to connect via instant messaging through the discussion forum. You can add certain members to a group chat and even pull up a contact to reach out to them directly via call or email. How accessible is the capital construction management software you're considering? Projectmates is ultra-portable, using responsive design to allow users to login to the software via a smartphone, tablet, or desktop. Projectmates is also browser-agnostic, meaning that it's compatible with all modern web browsers such as Chrome, Firefox, IE and Safari. Is the software you're researching simple and easy to use? Projectmates focuses on the user experience, making it easy to navigate and maneuver around within the software. With a shorter implementation time compared to other software, Projectmates minimalizes risk to clients while maximizing ROI. How does your chosen construction pm software hold you accountable? Projectmates is a role-based construction project management software, meaning users will only see the project information relevant to their role, and Projectmates removes everything else from their visibility. On top of that, Projectmates gives you the ability to track metrics on overall project status through ad-hoc reporting and program dashboards. 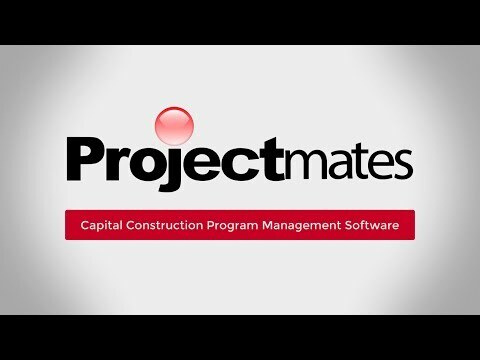 Projectmates is "best-in-class", providing over 40 modules to manage your capital construction projects. Essential tools for document/design management, workflow automation, contract management, project scheduling, bid management, project dashboards, and ad-hoc reporting are some of the top features that Projectmates is proud to have and serve construction owners with. As the industry standard, Projectmates by Systemates, Inc. has won recognition and several awards. With over 20 years of experience, construction owners have relied on Projectmates to execute and complete over 100,000 projects. Projectmates has an excellent rapport serving Retail, Education, Government, Healthcare, Real Estate, Commercial Construction, and Program Managers. Most recently, Projectmates customer spotlighted Nando's, who was shortlisted for the Restaurant & Bar Design Awards. There are many factors when choosing the right construction management software. If you're not sure what to look for, be sure to check out our guide on Questions to Ask Before Investing in Construction Management Software. For further information, take a look at Projectmates Overview. To schedule a personalized demo with Projectmates, click here. We all know that software should be easy to use and intuitive, but the majority of solutions available today come with a steep learning curve and a glossary of new definitions to learn. Should Implementation Take Years? The simple answer is no. Projectmates award winning system can be implemented in 2-4 months.